May | 2013 | VeReViewS! What do you get if you splice Marvin Gaye‘s Got To Give It Up & Madonna’s Give It To Me, with a dash of saucy lyrics throw in a rapper (T.I) & one of the men of the moment Pharrell Williams; plus a little controversy (the unrated video) you end up with Blurred Lines which is shaping up to be Thicke’s biggest ever UK hit. 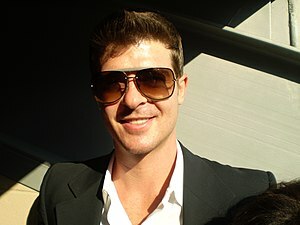 Robin Thicke is no overnight sensation, think of him as Justin Timberlake but without commercial success, apart from his 2007 hit Lost Without U, however Blurred Lines, taken from the forthcoming album of the same name is about to change this. Blurred Lines is a record that will get any party groovin for sure, with an infectious yelp, a Prince like falsetto and a heavy bass. Is there an act this year that Pharrell wont gatecrash? Sharleen Spiteri & her gang are back with a new album with a familiar sound. Like so many artists they have gone back to what had made them successful. No fancy American executive producers Texas have largely kept the production in-house. This is the tightest and rawest they have sounded in years. Some have commented over the band aping The Pretenders, Debbie Harry & Blondie, but who were they aping? Texas delve straight to the source. Proceedings kick off with the title track & current single, The Conversation, it is an obvious choice as a first single as it says look Texas are back. It sounds as if Texas have re-discovered the Texas sound, it’s lean & taut, Sharleen’s vocals are both haunting and confident . The conversation sets the listener up nicely for what’s to follow. Dry Your Eyes is one of a number of songs that sound heavily influenced by 60’s girl groups. If This Isn’t Real – sounds very much like a Phil Spector track, it brings to mind Then He Kissed Me. Detroit City is the best of the rockier numbers this track wouldn’t sound too out of place on a Garbage album. I can see this track being a real crowd pleaser. FYI Detroit City is known by other names i.e. Motor City & Motown. Hid From The Light is another up tempo rocking number this is a song that I can imagine Deborah Harry singing. One of the standout tracks on the album is Be True, this is Texas at their very best. One of the best Motown tracks never to have been recorded by a Motown artist; if you catch my drft. Maybe I – whenever a song lyric starts with maybe I , I cant help but singing didn’t love you. Maybe I sees Sharleen in reflective mode, this track could have been written for Elvis Presley. Big World is their River Deep Mountain High & Proud Mary moment, this sees Texas in playful mode, even the lyrics have a nod and a wink to Proud Mary, “The world keeps on turning trying to find my feet…” This has potential single written all over it. Listening to the album you cannot help but feel that Texas have been heavily influenced by girl groups of the 60’s the Shangri- Las, The Shirelles & The Crystals to name but a few. The longest track clocks in at 3.42, these are taut compositions, Texas are not messing around with overlong, over produced numbers, its as if Texas have got rid of the fat and given us nothing but the meat. They have served up a taste of Americana in their own indomitable style and prove to us that they haven’t stopped talking yet. Primal Scream have certainly given their fans something to get their teeth into on More Light clocking in at just under 70 minutes; they are not afraid to switch genres from almost lounge singer to angry rockers and to psychedelic hippies. Goodbye Johnny slows down the pace is slinky and almost lounge. Invisible city – has cross over appeal and more energy than most of the songs in the current top 40 – love this city such a beautiful city. Walking With the Beast has a tripped chill out feel about it. Its Alright Its Ok, closes the album and sounds like it could have come from the Screamadelica sessions, it is uplifting and. easy on the ear, this is definitely this albums Movin On Up. It’s a pity that there are not a few more tracks like this; as it is worth purchasing the album for this song alone. Primal Scream on More Light sound like a band energised with loads of ideas, however, More light is not easy to digest in the one sitting because just as you think you have figured it, Primal Scream throw in a curve ball and switch genres. Daft Punk have truly gone back into time to the 70’s & 80’s and have brought back Nile Rodgers & Giorgio Moroder with them along with a number of more up to the minute collaborators, but does Random Access Memories live up to all the hype? The Game Of Love – starts of slowly it sounds like it could be off any 80’s soul album before the Robots vocals kick in, later on in the album we get Beyond which has a startling opening and then gives way to a tune that sounds very much like I Keep Forgetting but with a robotic vocal. Giorgio by Moroder feat Giorgio Moroder is Giorgio Moroder speaking about his early days in making music over a funky beat which is not dissimilar to Cerrone’s Supernature. Within feat Chilly Gonzales , slows down the pace, a beautiful ballad with a filtered vocal. Pharrell’s high pitch vocal urging you to lose yourself to dance with the robots pleading c’mon c’mon c‘mon & Nile’s funky guitar, how can one resist? Touch feat Paul Williams Starts off slow and sounds like a song from a show and then disco kicks in, I don’t know why but I am reminded of Don’t Leave Me This Way whilst listening to this track, this track takes so many twists and turns its hard to keep up. We also get another possible Cerrone reference (If Love Is The Answer) with the Robots asking If love is the answer you must hold on. There’s not much I can say about Get Lucky which has not already been said but here we get the full version and it sounds better than the single edit, Nile Rodger’s guitar work has never sounded better. Random Access Memories lives up to its hype -just, it may not be a straight to the dance floor album that many may have expected after Get Lucky, however, there is enough on this album to keep the sales ticking over with each subsequent single release. Random Access Memories may well be Daft Punk’s Thriller, has anybody noticed that the calligraphy on both albums are similar and on both albums in the top left hand corner. Shine A Light was originally released last year, however, made no impact on the official charts, however there is now a flicker of light, as this track has been chosen as the Official anthem of the FA Cup, could it be that this time around Shine A Light makes a better showing? Shine A Light transports you back to the early Madchester baggy era (for those of us older to remember this era) with a luscious Happy Monday shuffle, you can almost visualise Bez twisting his melons man to this. We are also given a psychedelic breakdown with the Rev lamenting about spending his gas bill money on Thunderball; and just for good measure we are given a splice of Rolling Stones (think Sympathy For The Devil). Shine A Light is easily their best most commercial offering since Heavyweight Champion Of The World. It stands on its own merits, but no doubt the exposure this track will now receive means that the time could be right to re-ignite this light. (David) Hudson is an artist with conviction according to his website which also informs us that he is a visionary who works to develop a musical brand with a unique sound of his own; he also has a famous big sister, so what about Hudson’s current single Chained. Hudson’s website is right; for he is guilty of the best use of a ukulele and harmonica on a pop record in many a year. Hudson certainly has an ear for a catchy tune and knows how to use his raspy vocals to great effect like he does on the second verse. There is much to like about “Chained” I particularly like the outro to this song. His fans are called Hudson’s Helpers, with his clean-cut “Teenage Dreams” looks I can imagine that a number of helpers would like to be “Chained” to Hudson. You might not know the name, but if you like Dubstep and Rudimental then you will definitely know the voice. With Plan B releasing more films than music; step forward into the limelight Mr John Newman. Newman packs so much into this song that you have to hear it more than once. A confident start and possibly another No.1 for Mr John Newman.